On a damp and cold Tuesday morning late in March, a hardy bunch of keen anglers and conservationists gathered on the banks of the River Roden, just north of Shrewsbury. We arrived ready to take part in a demonstration day of river habitat restoration techniques using natural materials. 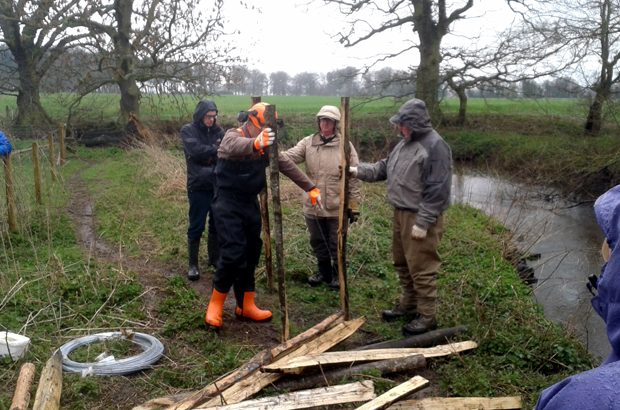 I’d set the day up, with help from colleagues in the Midlands Fisheries and Biodiversity Team, in conjunction with the Wild Trout Trust. 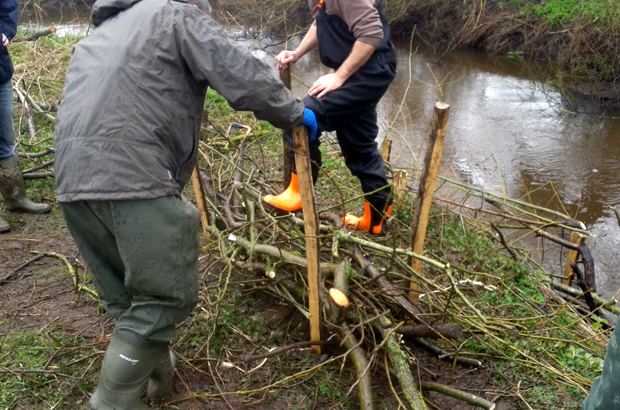 Our aim was to provide representatives from local angling clubs (and partners such as the Severn Rivers Trust) with the opportunity to witness and take part in practical demonstrations of techniques. They can then put these techniques to good use on their own stretches of river. We gathered in the pouring rain, any thoughts of a gentle start were dispelled with waders and waterproofs quickly donned. Attendees soon busied themselves gathering brushwood arising from nearby clearance work and recent storm damage from across the site. After this quite welcome ‘warm up’ and with suitable supplies of material, the main part of the day could begin. The enthusiasm of the anglers present shone through from start to finish. They listened intently and got stuck into the practical demonstrations on show. Many fishing stories were of course swapped along the way! Despite the weather (which in traditional ‘Geography fieldtrip’ style was pretty grim from start to finish!) the day was a great success. 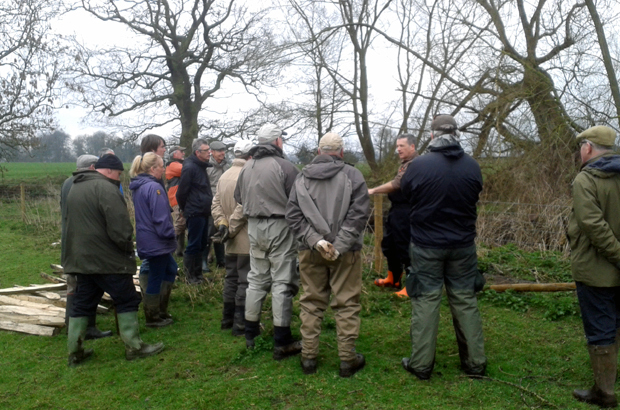 19 attendees were treated to demonstrations of various techniques such as pleaching (hinging) of hazel / alder / willow / hawthorn trees alongside the riverbank. 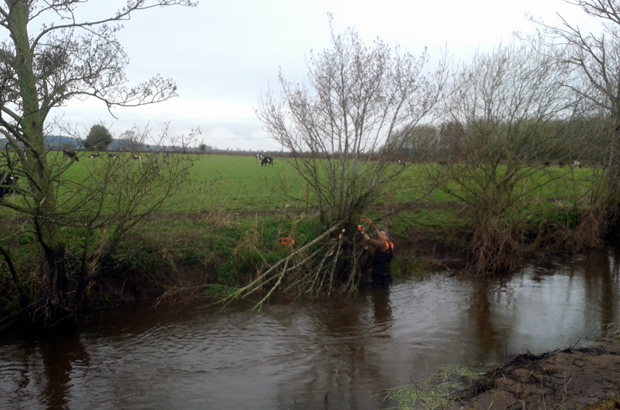 ‘Pleaching’ is where trees on the riverbank are partly cut, so that branches are bent downwards towards the water whilst still remaining partly attached to the main tree trunk and root structure. The techniques demonstrated had the aim of illustrating the creation of dense habitat cover for juvenile fish species. This kind of cover traps silt and helps to clean gravel areas, providing improved trout spawning habitat. 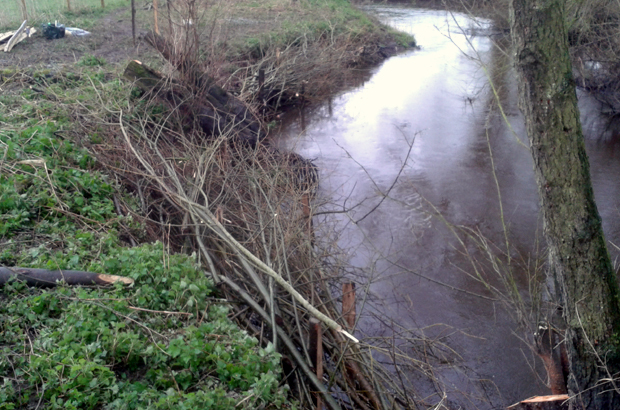 They also have the benefit of improving river bank protection by making it more resilient to erosion. My sincere thanks go to all who those made the day possible. I’m confident that all who attended will not only look back on a thoroughly enjoyable day, but will take the ideas and experience gained and be able to put them to excellent use back on their home stretches of river. Events like these are made possible by the money we receive from rod licence sales, grab yours now to help protect and enhance your local rivers and the fish living in them. What happens in a fish laboratory?